We were up and away early-ish this morning. Just before 9 am a boat came down the lock and wished us ‘Kalimera’ (must be our Greek flag which we use as a wind direction indicator) so we took advantage of the lock being ready and made our departure. Heyford Common Lock was soon passed, and fields of curious calves entertained us until we reached Somerton Deep Lock. We were fortunate here as a boat was just leaving & so left the gate open for us, then there were boats waiting to come down so we were able to do the same for them. Just half a mile on, was Chisnell Lift Bridge, one of the few that are left closed. Some people had said how hard it was to open, but I didn’t find it was, but the cross wind made it difficult for Joy to get back to the bank in order to pick me up, so I had to walk along beside until she passed a moored boat and was able to get me back on board. Joy chatted to another user while I moored the boat opposite, when I walked back across I met another ex-colleague from Heyford, Ian who now works there as a boat painter & general factotum. Whilst chatting to Ian, Joy’s phone rang and it was Ruth & Barry asking where we were, “In the launderette, where are you?” “Moored up behind you” they replied. Just then the wash finished & we loaded the dryer and all repaired to the ‘waiting room’ (a.k.a. The Great Western Arms) until the washing was dry and they continued on their way to Heyford, just as the rain started. I’m sure they make a habit of that! We just stoked the fire up and settled down in front of it for the rest of the day. Another nine o’clock start today, Aynho Weir Lock and Nell Bridge Lock were done and we pulled up at The Pig Place at 10 am and bought some logs & kindling, did I mention that we had had rain? Then it was off to Kings Sutton where a large digger was working to put in drainage for the lock cottage buildings it seemed. We passed through Twyford Wharf & Grants Lock arriving at Banbury’s Tramway moorings at 12:30 and treated ourselves to bacon and eggs for lunch. I’ve been giving some thought to repositioning our roof boxes to give better visibility ahead, so this afternoon I took my courage in one hand and my angle grinder in the other and cut off the brackets which hold the gang plank and boat pole and set to moving the boxes. Being a Wiltshire Boy, I took inspiration from the builders of Stonehenge and used a stack of planks to lift the boxes and slide them over the mushroom vents & side hatch. The debris of dead leaves and grime under them had to be seen to be believed! Tried to shift it, couldn’t even lift it! With the boxes safely re-positioned a temporary route for the cables was rigged up through a roof vent to get the system working. The roof was scrubbed and the plants re-arranged, no doubt to be changed again later. Co-incidentally we are moored in exactly the same place as when I made the boxes back in September 2011. This morning was rainy but it eased off enough for me to walk up town to post an item I had sold on eBay, when I came back we decided that it was dry enough to take the S4 bus down to Oxford. While we waited for the next bus we found a yellow sailing jacket for Joy at the Katherine House Hospice charity shop for just £1.99, they’ll be able to see her coming now! I’d forgotten just how long the bus takes, a teeth shaking ride of nearly 1 ½ hours through Oxfordshire villages. We headed for the re-vamped Westgate Centre and discovered Mowgli Street Food where I enjoyed Spice Omelette Wrap and Joy had Angry Bird and very nice they were too. Spice Omelette Wrap – Calcutta’s favourite street food. Fragrant masala frittata with coriander herbed cheese in a soft wholemeal roti wrap. Angry Bird – Succulent chicken thighs marinated & roasted in tandoor spices, yoghurt, ginger & garlic, served with popped mustard Mowgli Slaw. As the rain didn’t abate much we didn’t venture outside the Westgate Centre and decided to invest £6.50 each on a train ticket home instead of suffering a free ride on the bus, and got home in half the time. This morning we prevailed on Allison to drive us to church at Heyford Park Chapel where we caught up with some of our ‘old’ friends. It was a family service & was notable by it’s lack of children (just two) so the adults had to take part in the craft activities which had been prepared. Before we returned to the boat we enjoyed drinks & Barm Brack (Tea Loaf) at Kizzies. This evening we enjoyed roast beef dinner cooked on board, but before that we had an unscheduled cruise down to the water point, as that tap at Aynho must have been even slower than we thought and we ran out. Anyway, it was a nice evening and we cruised down the ‘The Cleaves’ to turn around. We moored up in the same spot but facing the other way which completely trashed our TV & phone signals! Allison had to go home today but before she went she kindly took us to Bicester to get some shopping & lunch at Sainsburys. This evening we went out to our friends Ruth & Barry where we enjoyed an excellent home-made Lamb Curry and chatted about our respective boating plans for this year. This morning Denise took Joy up to meet up with friends at ‘Get Active, Stay Active’ Exercise class at Upper Heyford Village hall, part of the Healthy Heyford initative. I meanwhile, took the boat on to Allen’s Lock, where Denise returned Joy to and came aboard for a chat & a coffee. On the way along I passed a new ‘End of Garden’ mooring with a boat I thought I recognised and a quick check of it’s registration number revealed it was indeed Lady Christine, one of the first boats I worked on at Heyford Wharf back in 2009, she has certainly had a very thorough makeover since then! We are moored in a peaceful spot far enough from the railway line for it not to be intrusive, looking out to a wild flower bank (see top image) at the bottom of someone’s garden on one side and the River Cherwell on the other. Good TV signal, good phone signal (GiffGaff/O2 network) but non-existent internet (EE) except through the phones. After spending a few days at Banbury Tramway moorings catching up with friends from our old mooring, Sandra, one of Joy’s friends from her Art Class and a visit from Toni & Chris from Somerton for a meal another visitor arrived on Thursday. Our friend Allison, from Gloucestershire, is staying with us for a few days so she drove us down to Heyford, parked her car there and we caught the train back to Banbury. The ‘girls’ went into town in the morning and hit the charity shops and after lunch we untied just before 3pm and passed through Twyford, Kings Sutton, ‘The Pig Place’ and Nell Bridge. We moored at Belchers Bridge at Aynho about 6pm where we were soon joined by a hen party on a hire-boat, they apologised in advance if they were noisy but after they returned from the pub I didn’t hear them at all. The ‘hens’ were up before us this morning (must have been a tame night) but we were away by 9:20 and stopped at Aynho Wharf to get a pump out and some water, unfortunately there were others with the same idea and an exceedingly slow tap so it was 10:45 by the time we got away from there. It was a good trip down passing through Somerton Deep Lock (Joy’s least favourite) and through one of my favourite stretches through Somerton Meadows down to Heyford. Just as we were approaching the lift bridge at Heyford we had a sudden heavy shower, but our friend Andy had just come through the bridge and opened it again for us. We moored just before Heyford Wharf, so we shall have to get used to being by the rail line again and will spend a few days here with Allison and catching up with more friends from our days down here before moving on. Our son Jeremy came to visit with his family (still the Easter school holidays, apparently) and we fed them with sausage sarnies for lunch, spent the afternoon chatting and Joy played cards with the kids. We ate at The Wharf before they left taking advantage of their 2 for £12 deal. 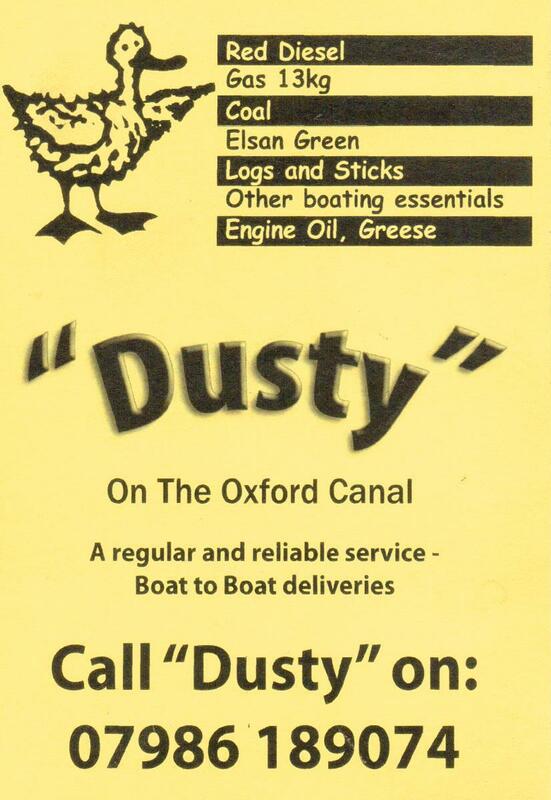 Whilst waiting for our meal we saw coalboat Dusty turning at the winding hole and I rushed out to ask them for diesel and a couple of bags of coal. Jock and Kati cheerfully served us in the drizzle, while I returned to my tea. After they had moored up they had to come into the pub too so that I could pay them. This morning was showery, but by midday it was just misty so we left, and travelled through Fenny Compton ‘Tunnel’ as far as Boundary lift bridge (near the Warwick/Northants/Oxfordshire borders) where we were hailed by Ian & Ali, previously of coalboat Gosty Hill and sometime neighbours at Claydon moorings which we passed soon afterwards. Then it was down the five Claydon Locks, past Clattercote Wharf and Elkingtons, Varneys & Broadmoor locks before mooring above Cropredy lock. A distinctly damp journey but with no actual rain. We managed to get an Oxfordshire TV signal (still Birmingham up till now) and settled in for a quiet evening. Canalside Real Estate, beats a caravan in the garden. It was after 10:30 am before we left passing a new canalside house being built (we saw the plot for sale back in 2015 see this post). At Cropredy Services we filled with water and went to dispose of our rubbish. Just a bit full, eh? I have to say the bins were an absolute disgrace, they couldn’t have been emptied for weeks. The situation doubtless has not been helped by the removal of the bins at Fenny Compton Wharf, leaving boaters to use the facilities at Fenny Compton Marina which are only available during opening hours and closed Sundays & Mondays. We only saw two or three boats on the move all the way to Banbury but it was an easy run, just four locks, and we arrived in town about twenty past one. We will stay here a couple of nights then move down to Tramway, near our old mooring and Morrisons. Sunday being a day of rest we stayed put, and it was rainy anyway, but we did don our walking boots, slosh along the towpath, and take the footpath through the lambs’ field up to All Saints’ Church Braunston (The Cathedral of the Canals) for their family service. My, my its a long time since we attended a service with hymn books and a formal litany, we’ve been used to having the words of the songs projected onto a screen. We spent the rest of the day vegging out in front of the TV, blogging and Teddy knitting. Today we pootled across to the water-point at 9am and once our tank was full set off through the iconic footbridge towards today’s target, Napton and at 12:10 moored just above the bottom lock where the towpath was less muddy. Before we left Braunston I contacted Napton Village Stores through Facebook to check if they had a butternut squash to go in this evening’s meal, they had just one left and kindly saved it for us, so my first job of the afternoon was to go and collect it along with some other provisions. I got back just before the rain set in again for the afternoon. This evening we are expecting our friends and my erstwhile colleagues Paul and Rosemary to visit us for a meal, to chat about our plans for later this year and, no doubt, to generally put the world to rights.